Note (2018-12-18): See the note in the first part about this version of this story no longer being canon. Like, look at the fourth section. Notice how I talk about ants. Tradia is a fictional planet. There are no ants. Akati, the watcher goddess and the third-person narrator, does not know what ants are. The Ministry of Dreams also mentions a monkey being used to advertise cereal. I would like to clarify that there are no monkeys on Tradia either. Since this story, I have introduced a strict “no Earth animal mentions” policy. Don’t ask me why there are humans. Or do, but give me time to make something up. The once-determined team stands panicked and hopeless. The final score had been screenshotted and recorded. The city had voted to keep the system, now holding a vote for a new law every day instead of every hour. But there are still seven hours left today, and seven more laws to pass. Mike gives a couple more tugs at the door, then sets to work along with the others in devising their new submission. The Skiriq building, affectionately known as Tower Hall, once loomed over the Kylani capital. Now its greatness is diminished as many other buildings scrape the sky alongside it. Every normal day, Tower Hall hosts a variety of bored children, angry citizens, and its many employees, hard-working or idle. Today, the Hall only contains the central government. Today, everyone else has been evacuated. Today, the government stares in fear at their computer screens, turning over hypothetical legislation in their minds. Today, a city is held at gunpoint and forced to do whatever its angry citizens demand. Today is not a normal day. Two men, reunited after an ordeal, sit at a small metal table in a plainly decorated, deserted café. A law passed earlier today declared that all cafés must now always be kept open as public spaces. “That is crazy,” laughed Edward for the first time in a while. They laugh, and look at the fading sun. The citizens are restless. They form a large crowd, and fill the whole space, like ants if their home was upended and poured onto the ground. They were led here this morning, locked in, and left with several police guards, but no other government contact. They tried to limit the citizens’ access to the internet, but everyone has their own phone, and it became an impossible task. Now they just hope that they don’t vote to overthrow the police force. Less like ants, they are not all working together. Smaller groups – although you’d be forgiven for not being able to distinguish them – have formed, and are each discussing which law they want passed, and which one they should all vote on. Now the loud discussions from each group are, for once, all about the same topic. A large array of new and fairly detailed proposals has suddenly appeared, and some have noticed that they all appear to be submitted by members of the police department. Many of them receive votes, and many people take the idea and decide to submit several ideas of their own. This is the 5PM vote, and it will be the most tightly contested yet. The street leading up to the Skiriq building is quiet, except for the wind. Dropped fliers from a recent event here float around like tumbleweed, as abandoned as the whole city seemed to be. Evacuations began to take place after the second vote as many feared the worst case scenario, and now Kylan’s capital lies empty and expectant. Charlie and Edward, against everyone else, are walking up the street towards Tower Hall. An iron pole rests on Edward’s shoulder, for the likely case that they have to break in. The air around them teems with data transmissions as the many suggestions receive votes. Nothing this hour will make any real impact, but the changes are still significant enough that everyone is excited about the result and wants to vote on which ones they like the sound of. Here we are. Tower Hall. The central base for the whole of Kylan. And now we get to smash it open. Eddie wasn’t even going to bother with the doors, but I try them anyway. Locked hard shut. Fortunately, the Skiriq building’s exquisite modern architecture means that the ground floor’s main wall is a massive pane of glass. Or it was. I flee as shards of glass bleed from the space where the window was, shattering and crunching like snowflakes on the cold, hard ground. We’re in, and so far we haven’t been gunned down. So either this guy is an idiot or figured no-one would actually try this. Either this is going to go very well, or we’re in for a lot more than we thought. No receptionist loses their smile as we break in. No safety officer comes to protect people from the shards of glass. No confused worker tries to stop us from climbing the stairs. Undeterred by the eerie absence of life, we continue to the 14th floor – where the main parliament meetings are held, and where the action is presumably taking place. The door to the chamber is, of course, locked. It’s actually boarded up, too, so we have no preview of what we’re about to encounter. Eddie moves to break down the door, but I stop him. They stare at us. They don’t speak, just watch. I look around for the guns aimed at their head, for the man watching over them carefully. But they’re not there. It’s just the main parliament. Why are they doing this? Is it of their own free will? They remain silent. I look at the iconic table, seen so many times in news footage whenever there’s another political drama. Aside from the usual microphones and place markers, there’s a single piece of paper on there. A television in the corner (notably, the only one in the entire city not showing a message to check the internet) simply displayed a countdown timer. 23 minutes until 5PM and another law passes. And that was all. Someone set this up, but isn’t threatening them. “Why don’t you leave?” I asked, shocked. Senator Evans gives in and breaks the apparent vow of silence. “We just broke into Tower Hall and went up all fourteen floors with nobody stopping us.” Eddie’s had enough crap for today and isn’t going to take this. Evans was still the only one who dared to speak. Now it was Evans’ turn to sigh. The small group stares in fear at their screens as the clock ticks down. It’s like sports commentary at this point. Perhaps that’s what the controller wants. “Three-minute buffer,” she mutters. She thinks there might be an attack after the game ends and wants to make sure the police isn’t there if there is. The citizens anxiously watch the same page and the same clock, waiting for the same event at the same time. Not many know what two of the top three proposals are hiding. They simply want to know what’s going to happen – how their country will change. The seconds tick towards 100. The votes are so close that it might not be clear which one won when it’s over. 4:95. Tick. Tick. Tick. Tick. Tick. The small police crew walks urgently, though carefully, along the silent roads. Mike checks his phone. The final law is signed off, and normal service is resumed. But this isn’t quite over yet. The parliament still looks uncomfortable, especially when I suggest leaving. Fair enough, I guess. We head downstairs from the fourteenth floor and back into the eerie reception, now coated in shards of glass. We approach the exit, and are startled to find that we’re not the only ones coming to check up on Tower Hall. What can only be described as a band of thugs stood before us. Luckily, they’re just as surprised and start anxiously discussing what to do. “This wasn’t in the plan, boss!” I hear one say. “Should we run?” I mutter to Eddie. But the party’s just getting started. “Get inside,” orders the guy who seems to be the leader of the group. “Let’s get out of here,” Eddie tells me. Of course, we’re stopped, but by the police rather than the thugs. The band of police push their way inside. The others follow after them. We’re left alone again, and the long street is quiet and empty once more. Whatever. We walk off, and leave them to it. At 5PM today, Kylan was released from the grips of a mysterious attacker, who took control of the government and the internet, allowing citizens to propose and vote on a new law each hour. All Kylanis will doubtless have seen the events unfolding themselves, but many don’t know exactly what happened throughout the day. We have been able to uncover exactly which suggestions were signed into permanent law. Eight new acts in total were passed: at 9AM, the Kylan military was banned in an sudden hour-long anti-war movement. The next hour, all cafés were forced to be kept open at all times as public spaces in a proposal which makes little sense in practice. The afternoon saw more positive change, as the long-standing wall between the northern cities of Tineep and Arteloa was determined to be demolished and the two rivals forced to “get along” through any means necessary. 2PM brought about the end of the Jonas Corporation, while the 3:00 vote outlawed the government’s controversial access to private citizen data. The last two had a more difficult fight. 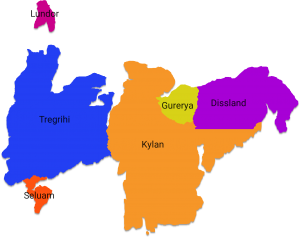 The tightly-contested 4PM vote ended in an extension of the hourly voting system (originally supposed to last only twenty hours), but the final law, which ostensibly resulted in the Gurerya area becoming an independent country separate from Kylan, brought about the end of the system through careful wording. Police chief Laura Dalton was behind this operation, who has also been praised for her quick evacuation of Kylani citizens living in the capital. She has announced that she is now committed to tracking down the unknown hacker responsible for today’s events. Finally, while several reports have confirmed that the system began at 8AM, it seems that it took a while for the entire internet to be replaced with the voting page. No-one has been able to confirm exactly which law was passed to begin with. Some have suggested that today’s laws should be repealed as soon as possible, while others have protested that they should remain a cultural icon. Normality will be restored tomorrow, but for many their lives will have changed in a very short time.